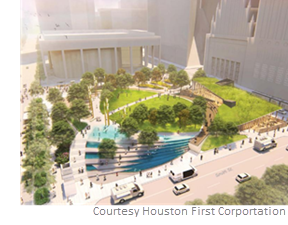 ​​​ HOUSTON –Jones Plaza in downtown Houston will undergo a $25 million redevelopment project. When finished, the 1.5-acre Jones Plaza—bounded by Texas Ave., Louisiana, Capitol, and Smith Streets—will be a programmable venue including a 4,000-sf dining facility. Construction will begin in May 2018, and is expected to be complete in November 2020. This project is possible through a partnership among Houston First Corp., the City of Houston, and the Downtown Redevelopment Authority.